US stock futures retreated on Tuesday following reports that U.S. regulators have told Bank of America Corp. and Citigroup Inc. that they may need to raise more capital. Growing worries about the likely impact of swine flu on global economy also pressurized stocks.At 8:36 am ET, Standard & Poor's 500 Index futures shed 15.10 points to 841.70. Dow Jones Industrial Average futures dropped 124 points to 7878. Nasdaq Composite Index futures plummeted 17.75 points to 1355.50. Shares of US banks retreated in premarket action on Tuesday. According to reports, U.S. regulators have told Bank of America Corp. (NYSE: BAC) and Citigroup Inc (NYSE: C) that they may need to raise more capital following stress testing of the two banks. Meanwhile, the World Health Organization has raised its pandemic alert level from Phase 3 to Phase 4 for the deadly swine flu outbreak, signaling that the infection is spreading fast among humans in community-level outbreaks. Swine flu cases in the U.S. have doubled to 40, and Mexico’s toll of flu-related deaths rose to 152. New Zealand and Israel have confirmed its first case of swine flu while there are suspected cases in Australia, France, Spain, Brazil. Drugmaker Pfizer (NYSE: PFE) Inc. said that its first quarter profit fell 2% to $2.73 billion, or 40 cents a share from net income of $2.78 billion, or 41 cents a share, in the prior year quarter. Revenue decreased 8% to $10.9 billion from $11.8 billion. Bristol-Myers Squibb Co. (NYSE: BMY) reported on Tuesday that net income from continuing operations remained relatively flat at 921 million, or 32 cents a share for the first quarter, compared with $877 million, or 32 cents, in the same quarter a year earlier. On an adjusted basis, the company earned 48 cents a share. Revenue from continuing operations increased 2.5% to $5.02 billion. Office Depot Inc. (NYSE: ODP) said Tuesday that it swung to a fiscal first-quarter loss of $54.7 million, or 20 cents a share, compared to a profit of $68.8 million, or 25 cents a share, in the comparable quarter last year. Revenue declined 19% to $3.2 billion. Late on Monday, US Steel (NYSE: X) slashed its dividend by 83%. The steelmaker swung to a first quarter loss of $439 million, or $3.78 a share, compared with net income of $235 million, or $1.98 a share, in the year ago quarter. Revenue tumbled 47% to $2.75 billion from $5.2 billion. On the front of economic data, February's S&P/Case-Shiller home price index and consumer Confidence data for April are scheduled for release on Tuesday. European stocks retreated in afternoon trade. 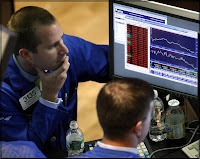 At 13:06 pm London Time, UK FTSE dropped 90.33 points or 2.17% to 4,076.68. The German DAX and French CAC plummeted 2.64% and 2.29% respectively. Asian stocks finished lower. The Nikkei 225 plunged 232.57 points or 2.67% to 8,493.77. The Hang Seng index of Hong Kong fell 285.31 points or 1.92% to 14,555.11. NYMEX Crude oil for June delivery declined $1.59, or 3.2% to $48.55 a barrel.